Contents: Beef nachos, chocolate Chip Cookie, Spanish rice, beans. Notes: Looks like there was something already eaten from the bottom right, maybe corn. Blech. 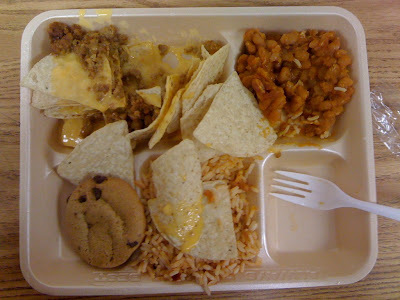 I love nachos but school cafeteria nachos always had that nasty powdered cheese flavored substitute instead of the real thing.